Tough guy football coach Mike Ditka has teamed up with Life Extension Nutrition of Ft. Lauderdale, FL and produced a good product. What is most interesting is that it is the only prostate pill with melatonin in it. 2 mg. Melatonin helps you sleep. I take 3 mg of melatonin every night to sleep better and it helps keep your hormones in balance. All men over age 50 should take 3 mg a night. Your prostate has melatonin receptors in it, and melatonin declines as you age, so melatonin is important. In this formula it’s kind of a gimmick to be able to say it helps you sleep through the night. You want to be able to sleep through the night because your prostate swelling has going down and sleep through the night because you don’t have to get up and take a leak a few times a night, NOT because some sleeping compound knocked you out. If you buy Prostate PM you have to take it at night. Take is during the day and you will walk around all sleepy! The Beta-sitosterol score of 199 mg is solid and actually is higher than what they claim on the label. The label says 180 mg, but with natural compound there is often a 10% difference, either higher or lower on an ingredients variance. So this is not that unusual. Next test it could be 10% lower. But the key thing is that the number is right around what they claim on their label so it lets you know they are one of the “good guys” who put in their product what they claim. The rest of the formula is nothing special. Lycopene –doesn’t work it’s a joke. Pygeum is basically useless even though tons of companies use it based on some misinterpretation of a few poorly supported studies that got great publicity years ago. 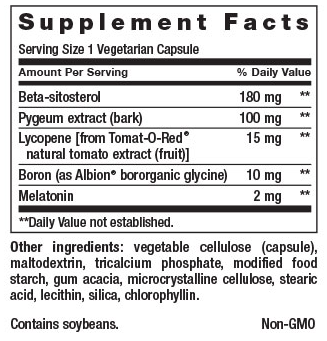 Boron is good for you and melatonin, if you have never tried it will defiantly help you sleep and is very good for you. The key here is that Iron Mike gives you a rock-solid 200 mg of Beta-sitosterol and that will definitely score some points for your prostate!